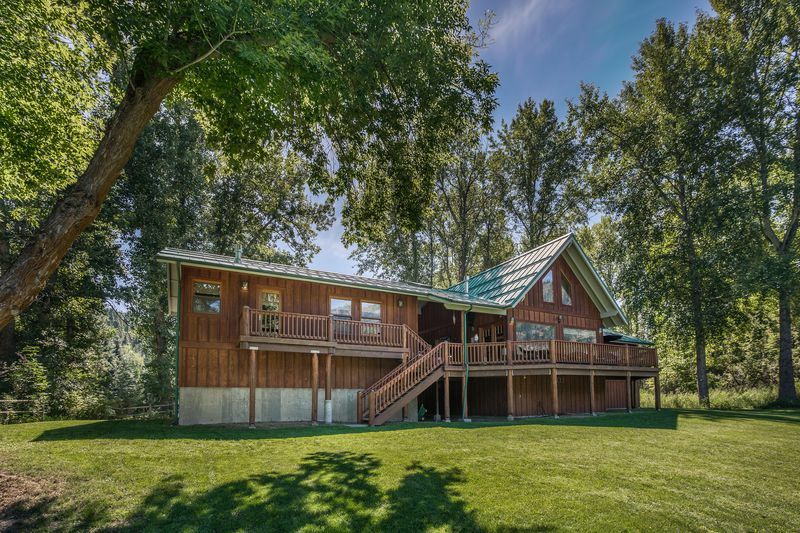 Outstanding and best river view in the Leavenworth area! Absolutely stunning! 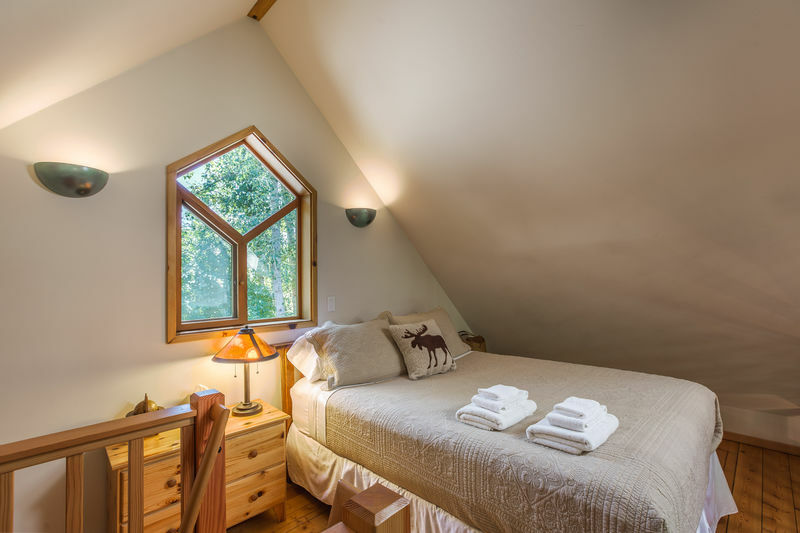 Edgewater Lodge is one of the most beautiful lodges that you will ever find for your special family getaway! 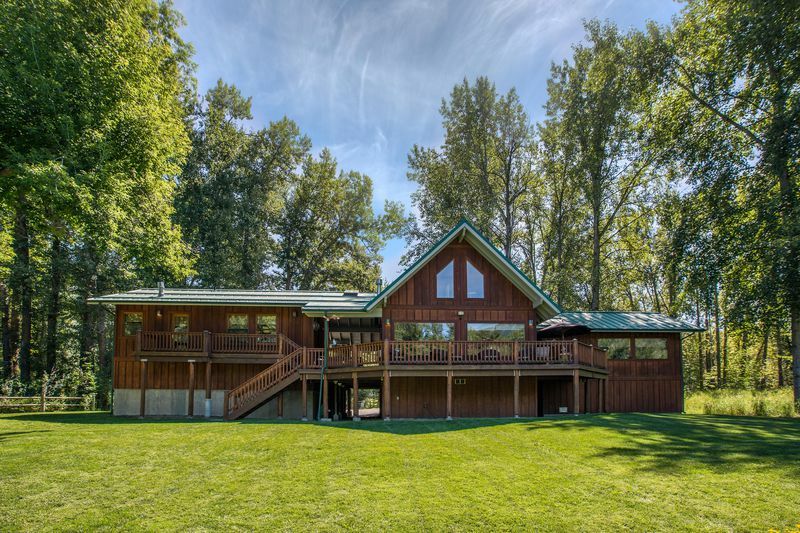 Located right on the edge of the Wenatchee River downstream from where the Icicle River converges with the Wenatchee and directly across the river from Leavenworth's Waterfront Park, this absolutely beautiful, contemporary lodge is unique in both its striking design and in its outstanding location. 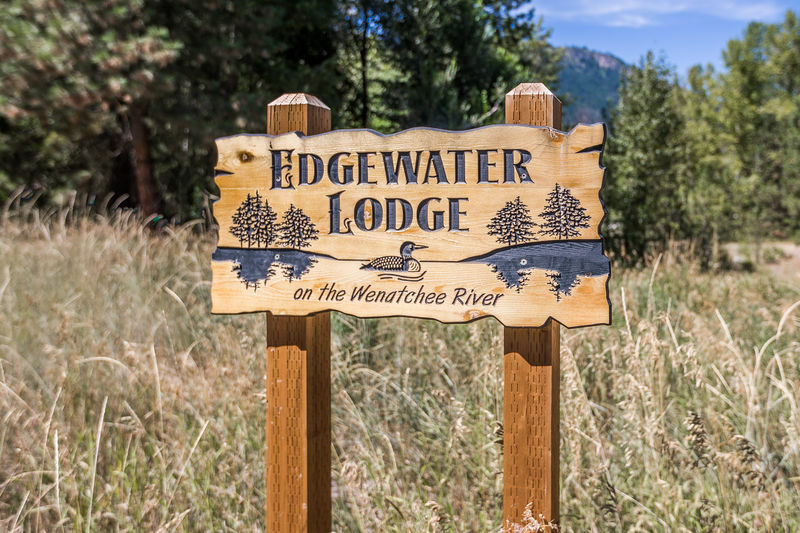 With a majestic view of Tumwater Mountain, as well as the gently flowing river and the lovely village of Leavenworth beyond, Edgewater Lodge is a perfect place to relax and enjoy the recreation in any season of the year. 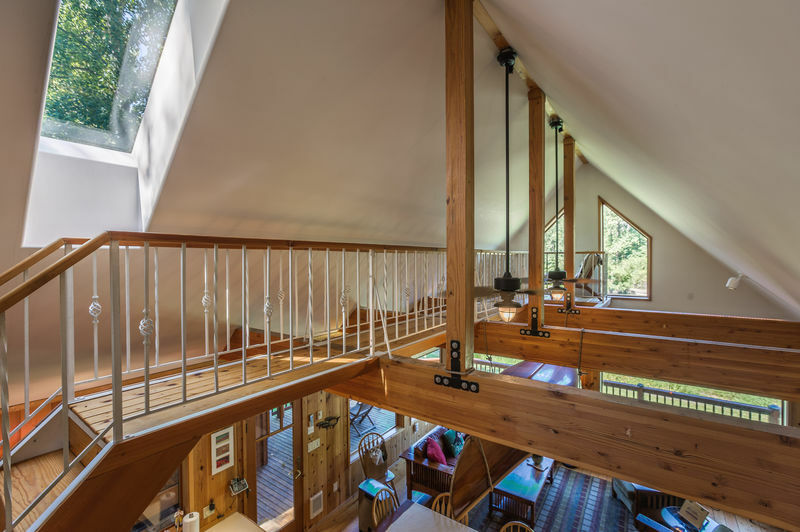 The lodge is constructed in three separate, but connected, sections. 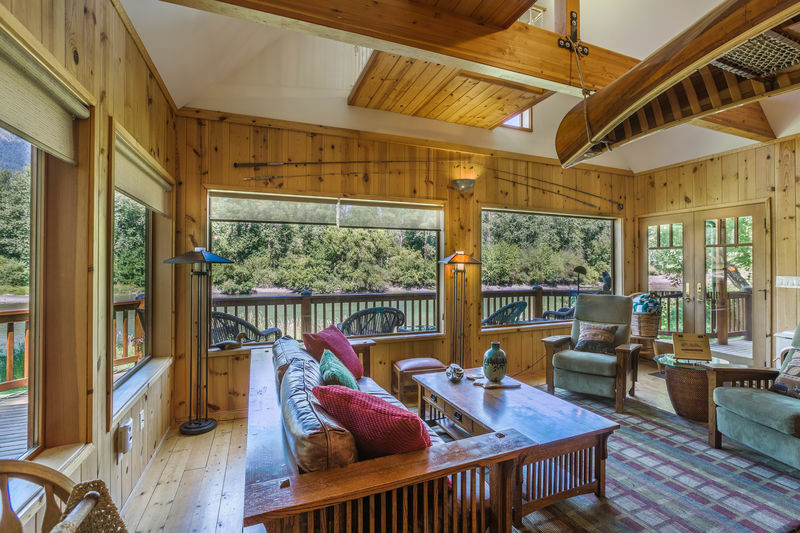 The middle "main" unit is a beautifully decorated and very comfortable “great room,” with a gas log stove and huge windows that frame the breathtaking river view and mountain backdrop. 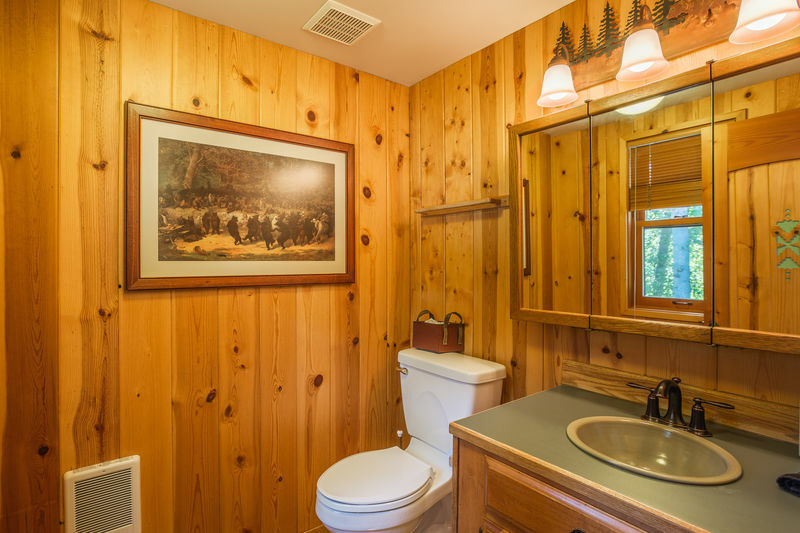 It’s the perfect place for dining, playing board games, or watching a football game on the large widescreen TV. 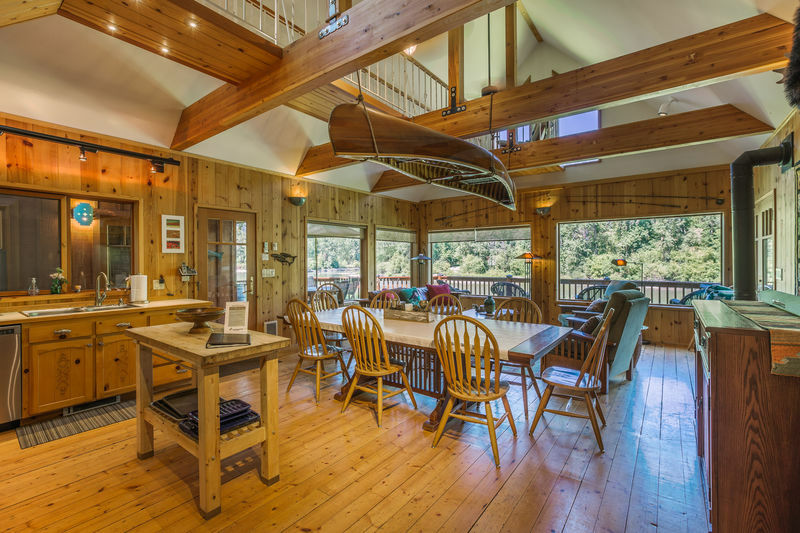 A fully-equipped kitchen with stainless steel appliances– including a double, commercial sized Wolf gas range with electric ovens– is part of the open great room, which features a stunning classic wood canoe suspended from the ceiling as part of the decor! 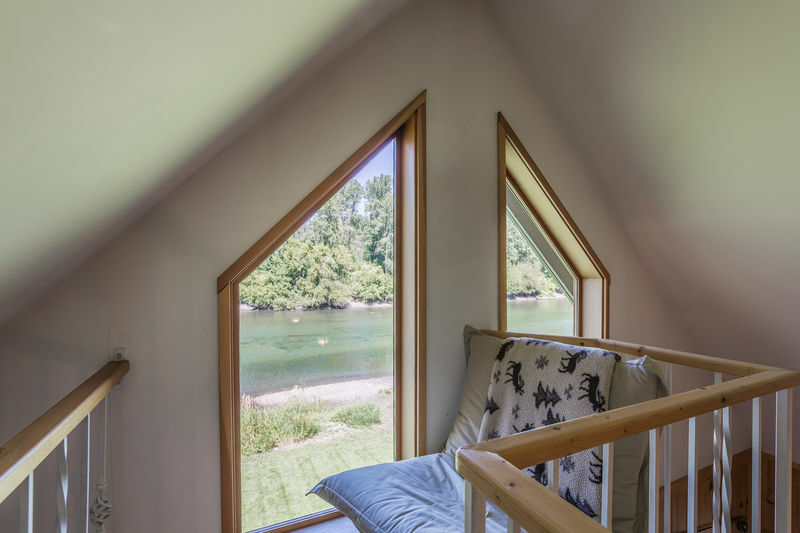 Accessed by a built in ship's ladder, is a quaint loft with a queen bed. 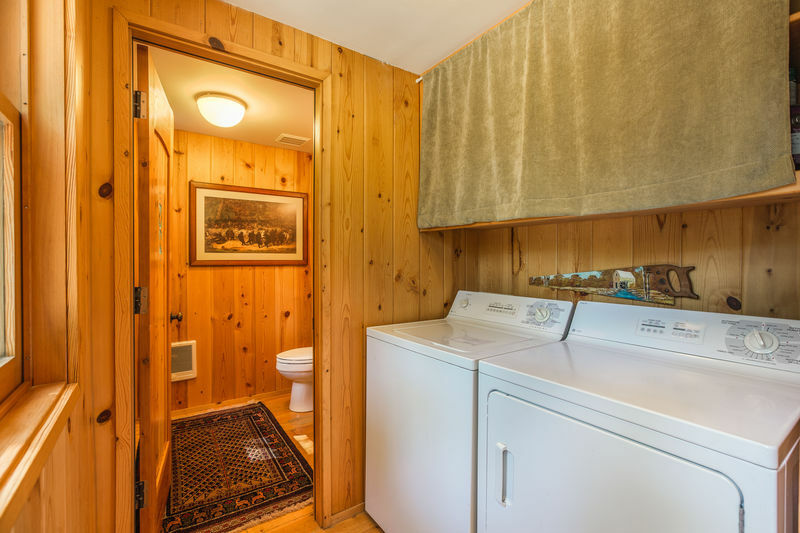 There are also a laundry and a half bath in the main unit. 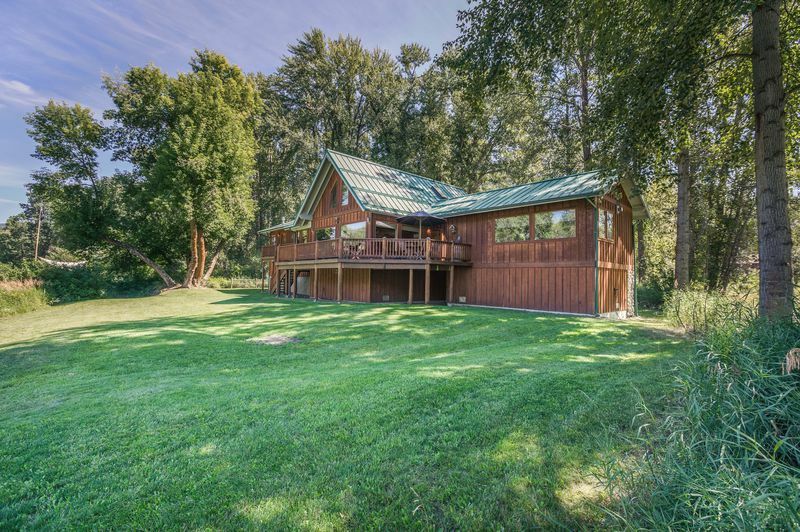 An outdoor breezeway leads to the spacious master bedroom suite on one side of the great room, with a queen bed, private master bathroom, picturesque view of the river, cozy gas log stove and TV. 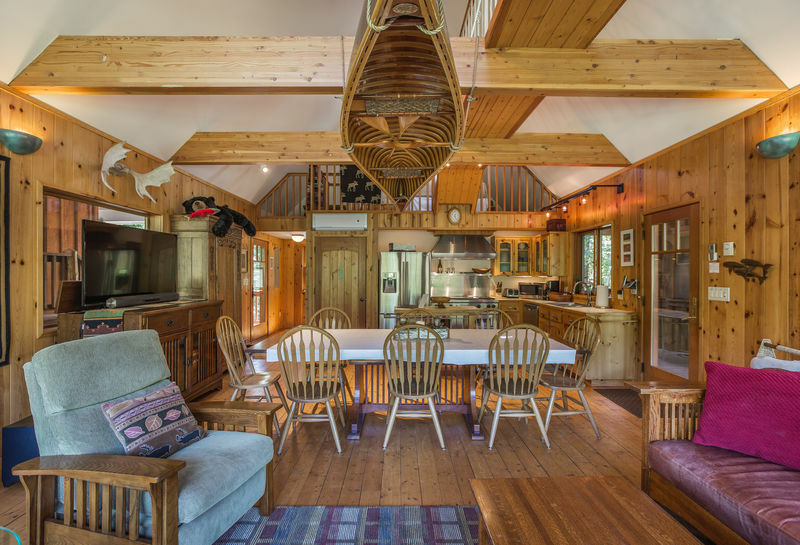 From the opposite side of the great room, another breezeway leads to the “bunkhouse” unit that contains three separate river view bedrooms– with a queen bed and gas log stove, another with a double bed, and a third with two single bunks– plus a full bathroom. 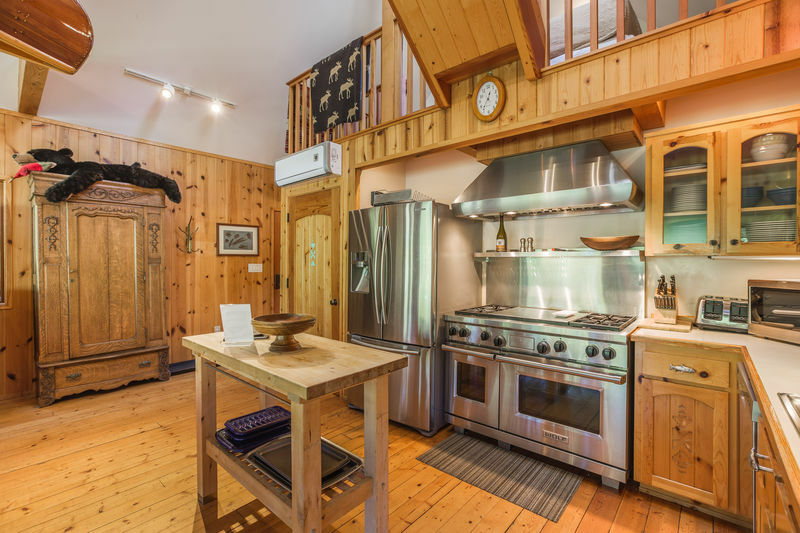 It also includes a kitchenette with a table and chairs suitable for snacks, reading, board games or a bit of TV. A large wrap around riverside deck offers places to enjoy the special sights and sounds of the river and the bountiful birds and wildlife that frequent it. 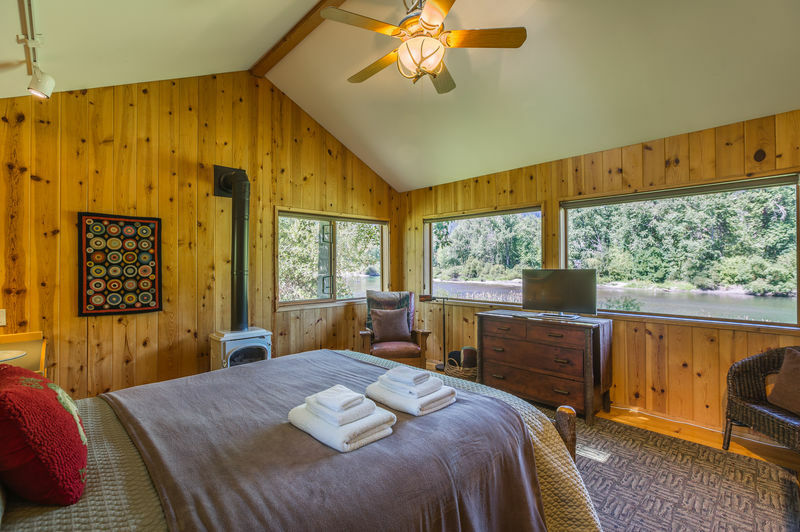 A hot tub conveniently located on a covered portion of the deck between the main unit and the bunkhouse, offers another opportunity for relaxation with a tranquil river view. 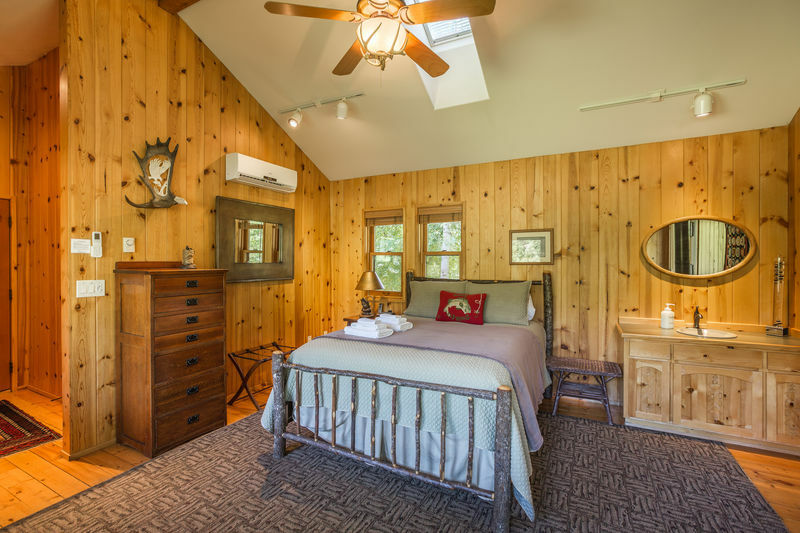 Altogether, the lodge sleeps 10 comfortably, with a total of 4 bedrooms and 3 bathrooms. 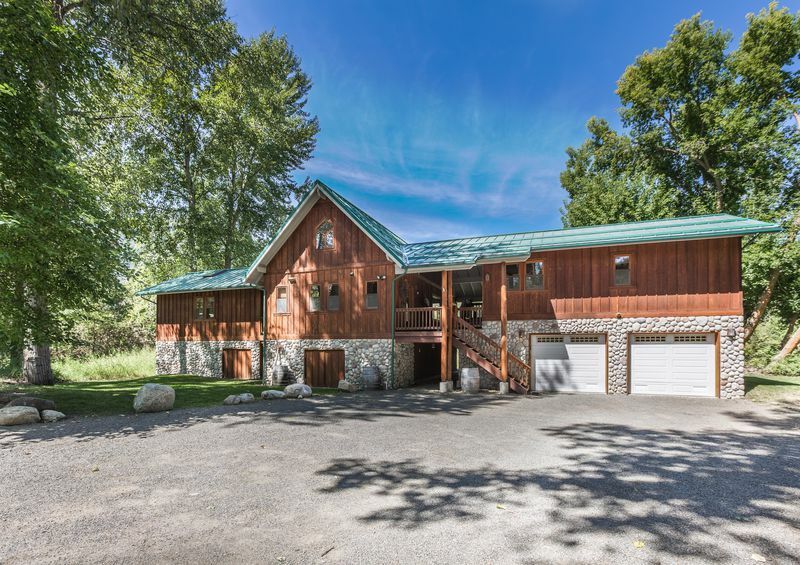 This highly attractive lodge itself is set back from the road and distant neighbors, creating a quiet, peaceful and very private setting. 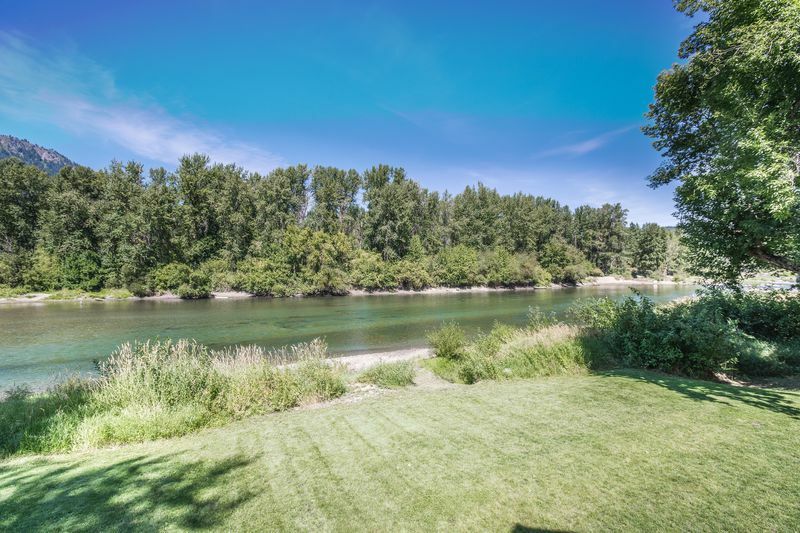 Situated right on the river, this is the perfect place for tubing or kayaking, or to sit and watch fishermen as river rafters go by. 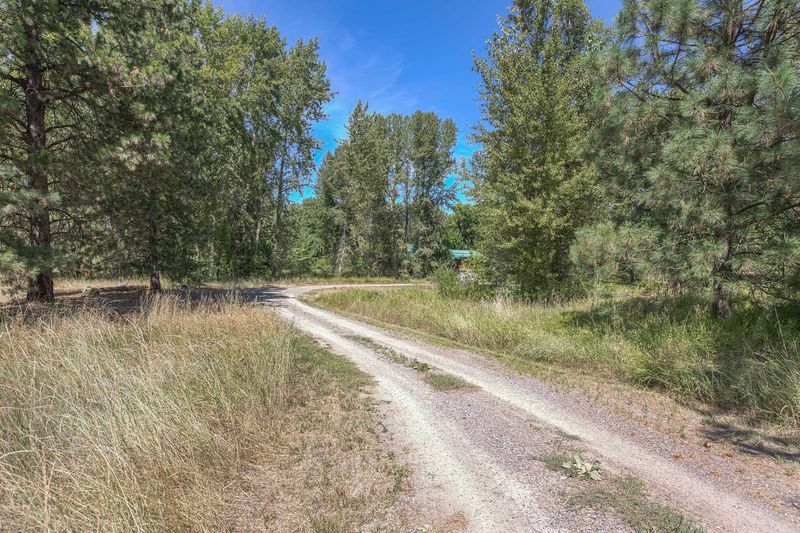 The immediate vicinity offers wonderful places to enjoy bike riding and hiking. 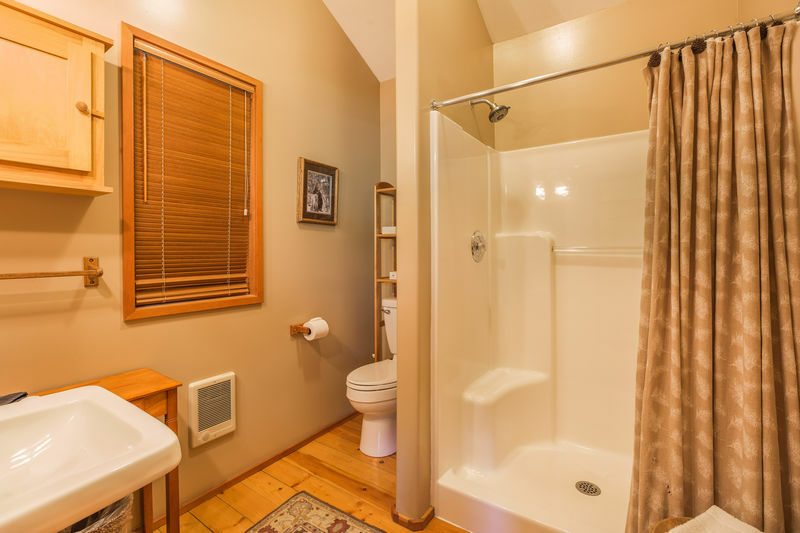 The home is also close to the festivals, shops, restaurants, golf courses, and theater in town. 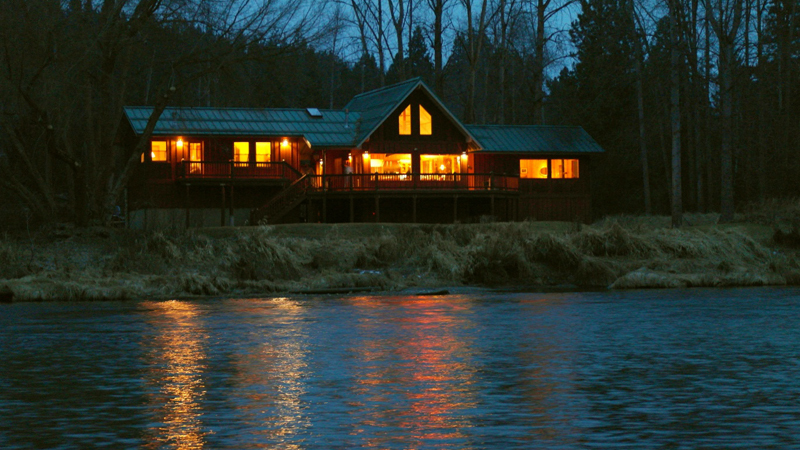 Edgewater Lodge is one of the most beautiful lodges that you will ever find for your special getaway! Book today!